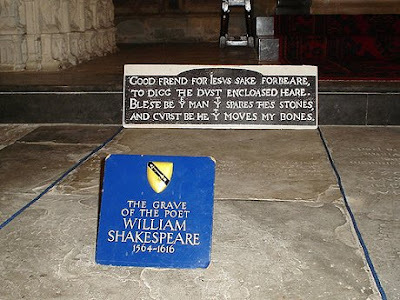 The curse that William Shakespeare had engraved on his tomb ("Good frend for Jesus sake forebeare,/ To digg the dust encloased heare./ Bleste be ye man yt spares thes stones,/ And curst be he yt moves my bones.") actually worked. Philip Schwyzer, a senior lecturer at Exeter University, said: "Shakespeare had an unusual obsession with burial and a fear of exhumation. The stern inscription on the slab has been at least partially responsible for the fact that there have been no successful projects to open the grave." Good thing he wasn't buried in San Francisco - or he might be making music today in a Wave Organ in "a wonderful assortment of carved granite and marble". Makes one wonder.